Building a custom engineered mezzanine is a cost-effective way to quickly add floor space to your warehouse without the need for costly building expansion. When it comes to designing the perfect warehouse, whether here in Maryland or across the country, efficiency should be at the top of your list. While aesthetics are important, the key to your success is productivity and the key to productivity is an efficient working environment. And one of the most affordable ways to improve both is to maximize the existing space in your warehouse. While remodeling can be expensive and cause you to close up shop for several days (Time is money! ), building a custom engineered mezzanine is a cost-effective way to quickly add floor space to your warehouse without the need for costly building expansion. A mezzanine floor system is a semi-permanent, free-standing steel structure that allows you to utilize the unused vertical space in your facility. Save Money by maximizing your existing warehouse space. Remodels can be costly and often result in an inordinate amount of downtime, which can further drive costs through the roof. Better utilizing your existing space makes much more sense financially. Mezzanine systems are Durable and designed to stand up to the day-to-day operations of the typical American warehouse. Most mezzanines are Custom Built to ensure your new system not only adds usable space to your warehouse, but also looks great. 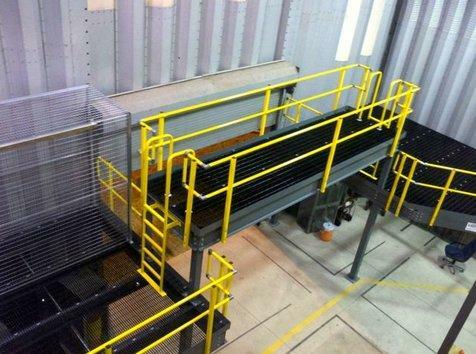 Mezzanines have a number of different accessories that can be added to maximize usability, including staircases, handrails, gates, ladders, bracing, and flooring. Mezzanine systems can be Integrated with a Number of Solutions – such as pallet racks, shelving systems, wire partitions, and more – to help create the ultimate material handling solutions for your warehouse. If you think a custom-built mezzanine system is exactly what the doctor ordered, consult a professional today. The S.W. Betz Company, Inc. has been providing businesses in Maryland and beyond with all of their essential Weighing, Material Handling, Dock, and Warehouse equipment since 1933. As a company, we have many years experiencing installing steel mezzanines and will make sure your project is taken care of from beginning to end. The S. W. Betz Company is a Cogan-recommended installer. All Cogan mezzanines are engineered with your business in mind. Intelligently built, the modular components easily adapt to your evolving needs, providing the added value, flexibility and functionality you need in fast-changing times. If you have any questions about Mezzanine Systems, please contact S.W. Betz by calling 410-574-1414 or 800-332-0322 today! You can count on the S.W. Betz Company to work with you and provide you with our extensive knowledge of the industry. This entry was posted on Tuesday, June 16th, 2015 at 5:10 pm. Both comments and pings are currently closed.